"To me a clean and attractive and even imaginative loo is the best..."
He's talking about retail shops and he goes on to say that a nice employee restroom is even more indicative of the pride in an organization. I'm thinking back on the school's I've visited and I think this applies to schools as well. Think about it, besides the cafeteria, it is the one place that every student visits every day. Some schools have "wall paper" or school news posted behind stall doors. Others have paintings and inspiration. Others are not a fit place to have a mud fight. But I'd like to challenge your school administration to grab your clothes pin and take the plunge (not literally, please.) Some time between classes go into the bathrooms of your school and look at them. What do they say about your students? 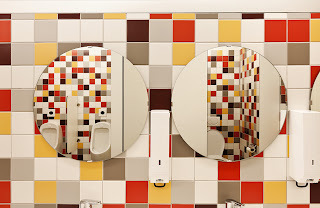 If a visitor came in and used the bathrooms, what would they think about your school? What do they say about your school? I think a big thing about education today is that the big things are a problem because we as educators have let so many little things go? We let things slide because we have plenty of excuses. If we don't teach students to clean up after themselves and if we don't get these bathrooms clean to begin with, what will the bathrooms in society look like in 20 years. We know that many parents don't teach children to keep things clean, but we should teach it in schools in a kind, but positive way. For me, it is my room. I've had a clean room for a year and a half now. My equipment is in pristine condition largely because of the message I'm sending my students. In my daily routine, I schedule in a 5 minute room clean up every day and a deeper clean 15 minutes a week. "But Vicki, the janitor is supposed to do that." Sure, the janitor is in my room and does that. But he doesn't wipe around my electrical equipment and he certainly can't be expected to clean my desk. I get out the 409 and wipe everything down and use my microfiber cloth to get the dust off my computers once a week. Although some students don't clean up after themselves, more of them do clean up in my classroom. It is because pride begins with me. It is such a little thing but it makes a big difference. I'm also going to take a tip from Tom Peters and start talking about these big little things on my blog too.